Overwatch is a great game with a colorful cast of unique and interesting characters, and a steady drip of new content. New maps, fun events, limited time game modes, and new loot keep people satisfied. But aside from all of that, the biggest shot in the arm the game gets periodically is the most game changing option: Hero releases, just edging out the surprisingly common hero reworks that have been coming out recently for the most impactful updates. Rather than speculate about upcoming Heroes though, I thought it would be fun to throw out some ideas for characters from other FPS games that would make great additions to the Overwatch crew. Starting us off, I think a character like Team Fortress 2’s Pyro would fill an underserved role in the game: a damage over time Hero. Unlike every other character from Overwatch’s older cousin, the Pyro is not already represented in the game by a similar character (Pharah as the Soldier equivalent, Widowmaker and Hanzo as the Sniper playstyles, etc.) and isn’t essentially impossible to implement with the design philosophy of the game (Spy is too unsatisfying to play against and goes against the idea of both teams being clear at a glance Blizzard has implemented). The closest you get to the Pyro is Mei, who has a similar “flamethrower” like gun, but serves as more of a battlefield controller. 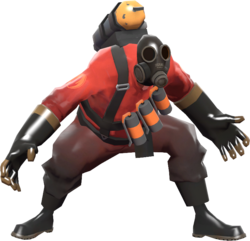 The Pyro’s ability to create disruptive damage over time on the whole team at once could add a lot of spice to the game, especially if Blizzard implemented their popular “puff and sting” playstyle to allow them to deal burst damage to burning targets. Their Ultimate would even be pretty simple to implement: give them a mortar cannon similar to the Dragon’s Fury which temporarily eliminates their drawback of being an incredibly close ranged character. I wouldn’t even be surprised if a Hero like Pyro was added in at some point. 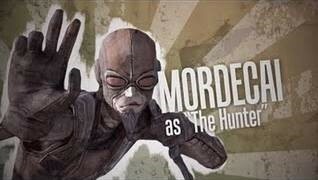 The next one I’m less sure about: Mordecai, the hunter of the first Borderlands game. He’s here because A.) he’s my favorite character from that game, and B.) I think one of his playstyles would make for a fun addition: the machine pistol packing pet build, which is based around firing an inaccurate, but rapid firing (and fast to reload) weapon and using his pet hawk Bloodwing to harass enemies. I see Bloodwing acting similar to the upgraded version of the “Rogue” tree of that game, attacking several enemies for low damage, slowing them and reducing their damage, and making the enemies drop health packs on kill. This makes Mordecai an interesting Offense and Support hybrid, similar to Soldier 76, who is rewarded for using his abilities and has team utility. Ultimate-wise, “Trespass” is the obvious idea, allowing him to temporarily bypass shields, making it easy to crack the main defense of key Heroes like Reinhardt, Orisa, and Brigitte. I say “less sure” mostly because of that last bit. It’s the only thing that really jumps out as “Ult worthy” (besides a more standard fire rate and damage buff in the form of Relentless) for Mordecai and could be an enormous game changer in terms of how team compositions would need to be thought out (since shield Heroes become just a bit less reliable when a character can completely negate their main purpose). This last slot I thought about a bit, since there were several characters from the same game I mulled over, the game in question being Rainbow Six: Siege. An Operator like Ying (who fires clusters of disorienting grenades), Jackal (who can track targets’ position; useful against heroes like Sombra or Tracer), or Finka (who can buff their entire team’s maximum health and remove the recoil from their weapons) could all be good additions, but eventually I settled on a somewhat more out there pick: Echo. It’s interesting to that that the crossover of characters seems to be happening more and more and across different verticals of entertainment. It’s not a surprise anymore to see a character pop up in land based casino slots, in bonus rounds, it adverts selling some yogurt or in online pokies which are a stalwart of Australian society as seen at AustralianCasinoClub. Echo is a defense oriented Operator who is based around piloting a small, fragile drone that can do reconnaissance and fire disorienting bursts of sound at enemies. I settled on Echo largely because it’s been a while since Blizzard released a defense oriented Hero; the game is about due for one, with Orisa being the last one I’d consider for that role that was released. It’s also about time another non-healer Support was released in my opinion, especially since Symmetra was reworked into a Damage Hero. The character theoretically fits very well, having a somewhat low damage but accurate SMG as his weapon, a demonstrably useful Support role in debuffing enemies by messing up their vision and sound, and being inherently more “safe” than Symmetra as he doesn’t need to be near the action to engage the enemy (though his drone can’t deal damage, giving it an inherent tradeoff for that safety). Maybe his Ultimate could add a damaging sound cannon, but it’s not really necessary. The problem is really twofold: the safety and disorientation both go against a lot of Overwatch’s UI and accessibility design. No Hero in the game has an “interface screw” effect; nothing messes with your audio or video (the closest it gets is certain weapons, like Moira’s Orbs or Biotic Grasp and Winston’s Tesla Cannon partially obscuring vision), and likewise no Heroes have the ability to consistently and reliably attack from perfectly safe positions. Even Torbjorn and Symmetra need to leave spawn to use their turrets (which deal relatively low damage and are stationary), and Junkrat only gets to do it with an Ultimate. Still, Echo (or a character like him) could add an interesting new Support playstyle to the game, and I’d love to see Blizzard’s take on a character like that. Well, there’s three of my top picks (though I’ve got a lot more ideas for new Heroes rattling around in my head). At this stage I’ll pass the question to you: what kind of characters from other FPSes would YOU like to see guest starring in Overwatch? There’s a lot of great candidates out there from just as many amazing games, and I’m interested to see what everyone else’ ideas are!